The Extra-Quiet Circulating Fan is ideal for mounting high in a doorway or hallway to move warm air out of one room into another. Its swivel bracket allows directed air flow. 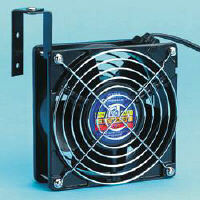 This 105 cfm fan works great with passive solar heating systems and air conditioning systems as well. It has a 12ft. plug -in cord with in-line switch.